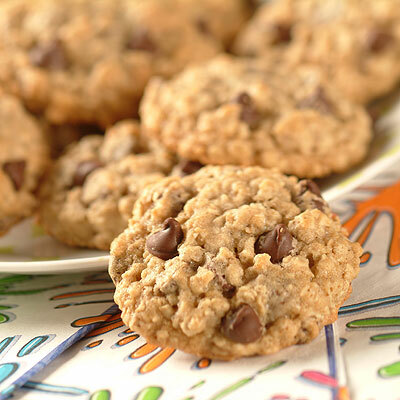 These Good-For-You Choc-Oat-Chip Cookies are fun to make. Totally easy...totally tasty! COMBINE flour, baking soda, cinnamon and salt in small bowl. Beat brown sugar, granulated sugar, margarine and applesauce in large mixer bowl until smooth. Beat in egg whites and vanilla extract. Gradually beat in flour mixture. Stir in oats, morsels and nuts; mix well. Drop by rounded tablespoon onto prepared baking sheets. BAKE for 9 to 10 minutes for chewy cookies or 12 to 13 minutes for crisp cookies. Cool on baking sheets for 2 minutes; remove to wire racks to cool completely.